Whether you're in train, bus, road, restaurants, or home, you'll find that people of all age groups are carrying a smartphone. Life is incomplete without smartphones Ã¢ the new age pocket computers. Whether you're in train, bus, road, restaurants, or home, you'll find that people of all age groups are carrying a smartphone. Some are busy in listening to songs, watching videos and playing games while others are interacting with friends through social networking platforms or various applications like WhatsApp. The tradeoff? Smartphone users have to pay a heavy price for the privileges. There is a huge market for smartphones. But it would be a mistake to let the hype influence you to make an impulse purchase. If you really want to buy a smartphone, then there are a few tips you need to follow to be tech-smart and budget-friendly at the same time. As per the Apple spokesperson, around 9 million iPhone 5s and 5c models were soldhas bough within 3 days of being launched in the market. Unless you're a tech professional, there is no need to pay a huge amount on the latest model of smartphone. Wait for a few months. You'll see that price of smartphones has dropped considerably. You can buy the same model your friend t at a less price. It is best to purchase an unlocked smartphone. An unlocked smartphone is compatible with lots of carriers. Most phone networks reduce the price of the device to grab new customers. They retrieve their money throughout the term of the contract. This makes smartphones appear cheaper than they actually are. You can get these smartphones with a contract from Verizon, AT & T between $199 and $399. A great percentage of saving lies in cheap no-contract service plans. Try to sell your smartphone before it's price drops considerably. There are plenty of websites wherein you can buy and sell smartphones. For instance, Nextworth, Glyde, Gazelle, etc. You can expect to receive $425 or more on iPhone 5s. This is not too bad an amount for any smartphone. Don't buy smartphone in a hurry. Compare the features of the smartphones first. Then compare the price tag. The best trick would be to buy a smartphone that has almost all the features you're looking for at a reasonable price. New smartphones are not necessarily good ones. Sometimes, the price of old smartphones drops when new models are launched. Suppose, you've an iPhone4 in your kitty. You really want to replace your existing iPhone with iPhone 6. Wait till the new model is launched and check out it's reviews. If the reviews and the features are not exceedingly good, then you can go for iPhone 5. You can grab a lucrative deal since it has been in the market since September 21, 2012. 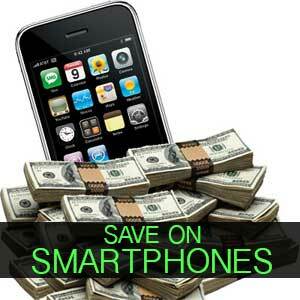 Once you've grabbed the latest smartphone without pinching your wallet, start saving money on the phone plans. Next, download free version of various applications in your smartphone.